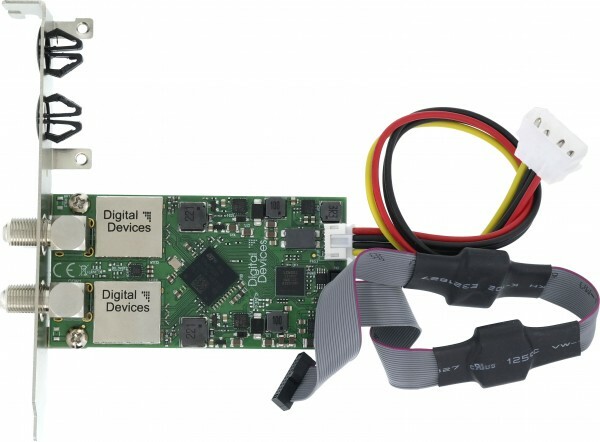 Product information "DD DuoFlex S2 V4A Expansion module - Twin Tuner expansionmodule DVB-S/S2"
Digital Devices DuoFlex S2 V4A - Dual DVB-S/S2 HDTV - Expansion board for Cine or Octopus series with newest demodulator (STV0910A - Improved compared to the version STV0910B) technology for high DVB-S2 transponder data rates up to 180 Mbits /s. NOTE: With the expansion module, you can upgrade an existing Cine CT (V6 or higher) or Cine S2 (V5.5 or higher) to a 4 tuner card or connect to Octopus Bridge. This expansion will delivered with a full profile bracket K and a 25 cm ribbon cable. The TV card consists of two parts, the tuner module and the Cine (S2 or CT) TV card or Octopus series. The Cine TV Card or Octopus Bridge is in this bundle not included. The Tuner module will via ribbon cable connect to a Cine Card or Otopus Bridge and has no electrical connection to the MainBoard. The Tuner Modul requires a 3,5" Floppy Power Connector. Slotbrackets for Low und Full Profile are included. Related links to "DD DuoFlex S2 V4A Expansion module - Twin Tuner expansionmodule DVB-S/S2"